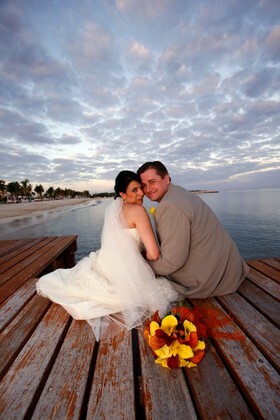 Mexico, and more specifically the Riviera Maya, is the perfect place for a wedding. White sand beaches, the aqua blue Caribbean Sea and balmy ocean winds make for an amazing setting and beautiful pictures. Welcome to our first Wedding Wednesday on Hacienda Tres Rios’ Facebook page. Each Wednesday we will be presenting photos, videos, links and other wedding tidbits. If you were married at Hacienda Tres Rios, we hope you’ll share your experience as well. If you are interesting in getting married at Hacienda Tres Rios and learning about packages and what is available, please see the Wedding/Honeymoons page on our website. Take a look at this video of Marissa and Louis’ wedding at our resort on October 2010.